With all of the chatter about the power of big data, it’s easy to forget that your best tool for finding better talent isn’t a database. A credible human link is a personal connection between us and amazing talent. It’s a peer recommendation. It’s an acquaintance made through professional and technical organizations or trade groups. It’s a referral from a valued consultant. Human because it’s personal and formed organically. Credible because the source is reliable – a friend, co-worker, colleague, mentor, etc. A credible human link understands your culture and the type of people who succeed there. 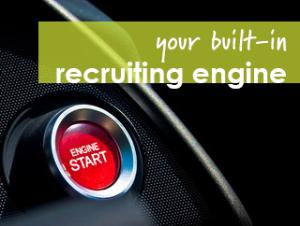 That’s why your workforce is the best recruiting engine your enterprise has. Tapping into the credible human links between your employees and talented candidates is an essential tactic in your talent acquisition strategy. Hiring employee referrals is faster because they come pre-screened. It cost organizations less – because it’s faster – and because attrition decreases with referrals. Are you getting the most out of the power of employee referrals? Let’s look at the bigger picture. Employees are the pulse of your reputation in the marketplace. Are your employees griping or gushing about you? Taking the pulse of your employer brand reputation among employees is crucial to attracting and retaining talent. If your employees don’t like working for your organization, they’ll be extremely unlikely to refer anyone that they like or respect. Approach employer brand both internally and externally. Collect anonymous surveys or use a third party consultant to get a barometer of employee satisfaction internally. Listen in on what employees are saying about your employer brand on social networks. Tools like Bottlenose and Google Alerts can help you assess the social health of your employer brand. So how do you take your reputation from ho-hum to vrum VRUM? Offering perks seems like an easy fix. But catering lunch and setting up a foosball table in every break room isn’t going to automatically change your reputation. Transparency can go a long way. Does every employee know the mission, value proposition, and core values of your organization? Do they know what is in the works that is going to change the game? Encouraging the employee working on widget X to get excited about their role in reaching company goals promotes better engagement with your employer brand. Creating employer brand champions is the first step. Channeling the recruiting power of your employees takes referrals to the next level. How do you tap into your employees’ extended network to reach better talent? Make sure they know who you are looking for. As an HR generalist, corporate or third party recruiter, you know that understanding the hiring manager’s needs is imperative to presenting the best candidates. In order to get the most out of your built-in recruiting engine, create a profile of your best candidate and spread the word internally. Finally, it never hurts to provide a bit of incentive. Innovative companies give huge bonuses to employees and non-employees alike for referring the best talent. Advertise your referral program, and be clear on what qualifies as a referral and what does not. Referral programs can be a simple internal policy, or you can tap into a wider audience with tools like Ambassador, GooodJob or Choozer Jobs. Anyone in talent acquisition roles will tell you that there is a shortage of skilled talent. Your employees can be your best secret weapon in building a better workforce. KellyMitchell matches the best IT and business talent with exclusive opportunities on an international scale. In addition to competitive compensation and one-on-one support from our team members, KellyMitchell consultants have the chance to work with exciting organizations in every industry. We connect job seekers with opportunity and clients with success. Our approach is personal. Our results are professional. Our reach is nationwide.